There is one big benefit and one big drawback to using the handicap system versus average golf score. The biggest benefit comes from consistency when playing courses of varying difficulty. This is because the difference in skill level of two golfers, as measured by strokes, will change across courses. If golfer A is 10 strokes better than golfer B while playing an average course, they may be 15 strokes better (or more) on a very difficult course. Thus, using average scores, golfer A will always benefit by playing his/her match on harder courses, in comparison to golfer B, who would rather play easier courses. 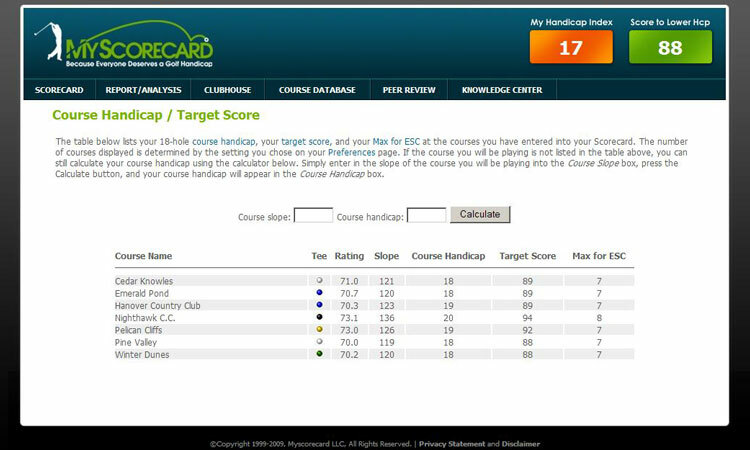 The handicap system (and in particular, course handicaps, which are calculated for you by MyScorecard) takes this into account to create consistency across courses of varying difficulty. The big drawback is that the handicap system favors better players. According to Dean Knuth, one of the developers of the USGA handicapping system, for every six strokes difference in handicap, the better player has a one-stroke advantage, because the lower handicapper is more likely to play at or near his handicap than the high handicapper. Therefore, in a match between an eight handicapper and a 14 handicapper, the better player is giving away six strokes, yet the odds are still 60-40 that he will win the match. This bias in handicapping based on potential has been known for a long time. Despite this, the USGA has preferred to handicap based on potential rather than average, to give players the incentive to improve their game. In our view, the bias of the handicap towards better players (perhaps 2 shots across 12 stroke difference in handicaps) is less than the bias created by varying course difficulty (more than 2 shots) and should therefore be favored. We look forward to your thoughts and comments on this topic. This entry was posted in Facts & Figures and tagged Handicap by John Reinhardt. Bookmark the permalink.